Free from artificial colour. Free from gluten, gelatin, sugar/lactose. 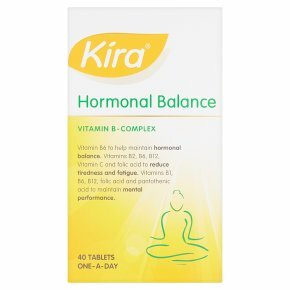 Food Supplement Kira Hormonal Balance is a food supplement providing an excellent source of B vitamins, Vitamin C and folic acid to help you stay in balance throughout the day. Vitamin B6 to help maintain hormonal balance. Vitamins B2, B6, B12, Vitamin C and folic acid to reduce tiredness and fatigue. Vitamins B1, B6, B12, folic acid and pantothenic acid to maintain mental performance. Vitamin B6 helps maintain hormonal activity. Vitamin B2 & Vitamin C help to reduce tiredness and fatigue. Vitamin B12 & folic acid help maintain normal psychological function. Dosage: One tablet per day with food. Swallow whole with some liquid. Do not chew. WARNING:<br>Do not exceed the stated dose.<br><br>IMPORTANT NOTICE:<br>Food supplements should not be regarded as a substitute for a balanced diet or a healthy lifestyle.<br>Keep out of sight and reach of children.